My travel adventures have taken me to some wonderful places in the world. One of those places was the beautiful Black Beach of Kamari, Santorini. During our trip, I paid particular attention to all the international cuisines. 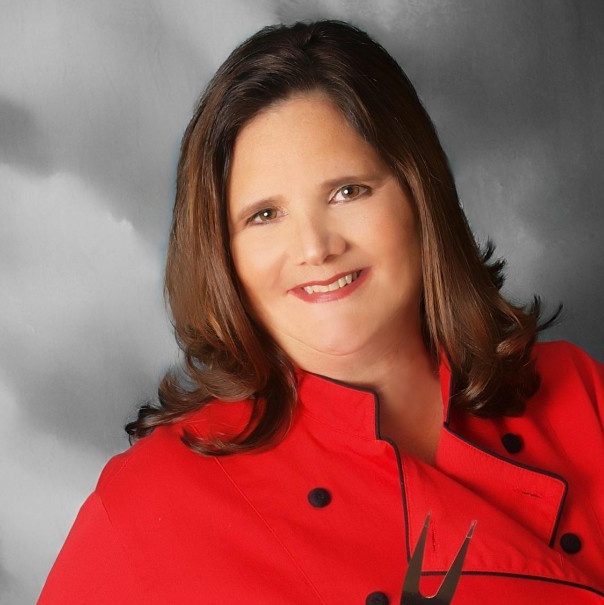 My culinary memories included delicious and light recipes made with the freshest seafood from the Mediterranean Sea. 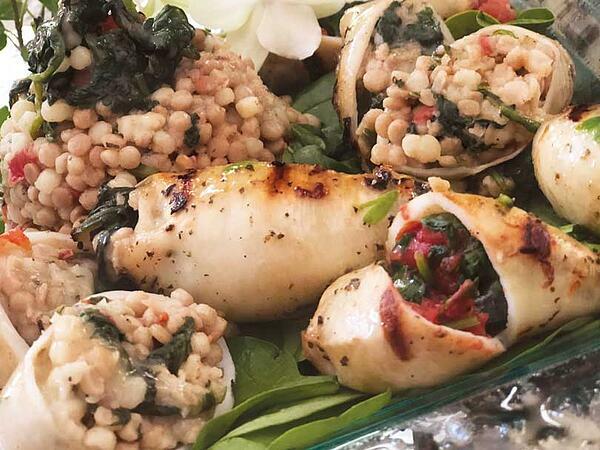 We (my darling Steve and I) enjoyed so many dishes, but the one I remember and would like to introduce my readers to is Grilled Stuffed Calamari. Most people have tried calamari fried or sautéed in the form of rings. 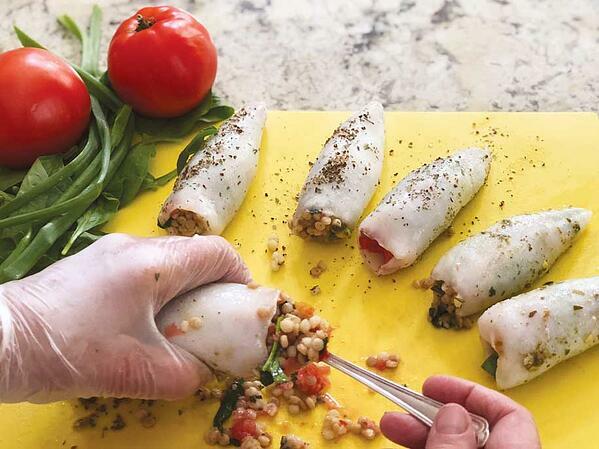 When you prepare stuffed calamari, you are using the whole body (calamari tube) after it has been cleaned and separated from the tentacles. The shape of the calamari is very conducive to stuffing because one end is tiny and the other end is usually large enough for a teaspoon to be used to stuff almost any type of vegetable or stuffing mixture. I have chosen tomato and spinach for my recipe with a whole wheat couscous. In my experience, cooks will want to season the calamari with lemon before cooking because seafood is traditionally seasoned this way. I urge you to follow my preparation method below and only add lemon after grilling to ensure tender, nutritious & delicious Stuffed Calamari on your ElectriChef grill. NOTE: The ElectriChef Electric Grill creates the perfect cooking environment for stuffed calamari because if you preheat your electric grill to 575°F, the dry, extreme heat provided by the ElectriChef grill will allow the calamari to grill very quickly and create a slight char to add flavor. You can either keep the recipe as is or leave off the couscous and create another outstanding Paleo recipe. I have done half Paleo and half with couscous. Place cleaned calamari tubes on a cutting board, pat them dry with an a paper towel and set aside to become room temperature. Rough chop raw spinach, then mix diced tomatoes, garlic and half of the Italian seasoning in a medium bowl. Lightly season mixture with salt and pepper. NOTE: If you choose to use the couscous, add to the spinach & tomato mixture now. If you decide not to use a starch, double the amount of spinach and diced tomatoes. As the spinach wilts down, it will add a great deal of flavor and moisture. It is essential to compact the spinach and tomatoes as you stuff each calamari steak. Using a teaspoon, stuff each calamari tube to capacity with the mixture and close the larger opening with a toothpick. Spray your ElectriChef grill grates with Canola oil then preheat your ElectriChef Grill to 575°F. 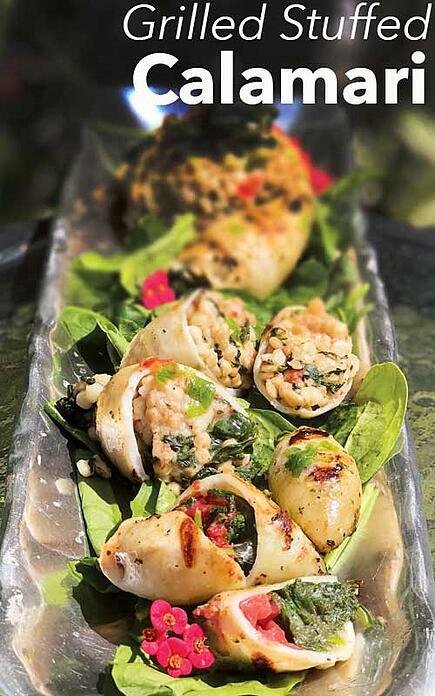 Drizzle each stuffed calamari tube with olive oil to cover entirely. 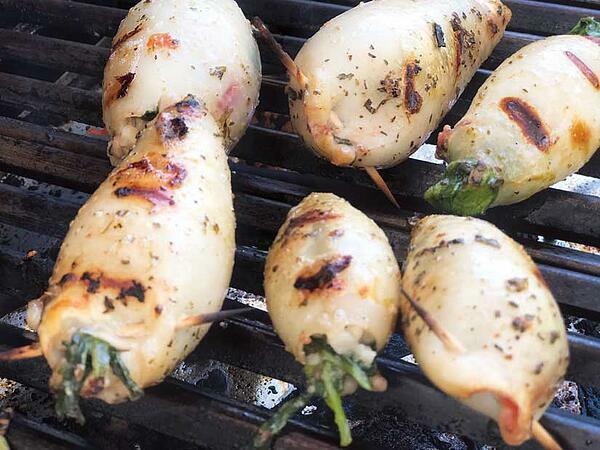 Using tongs place stuffed calamari on your ElectriChef grill and close lid immediately. 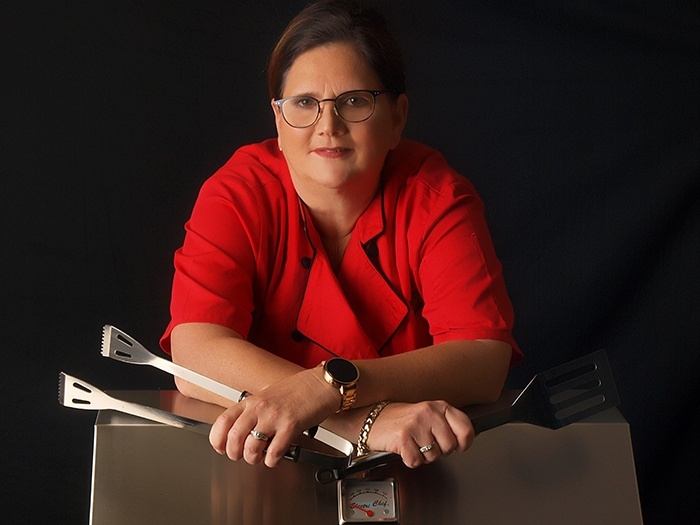 After 2-3 minutes open grill lid, and using tongs, turn calamari over for another 2-3 minutes or until opaque with a slight char. Close grill lid. 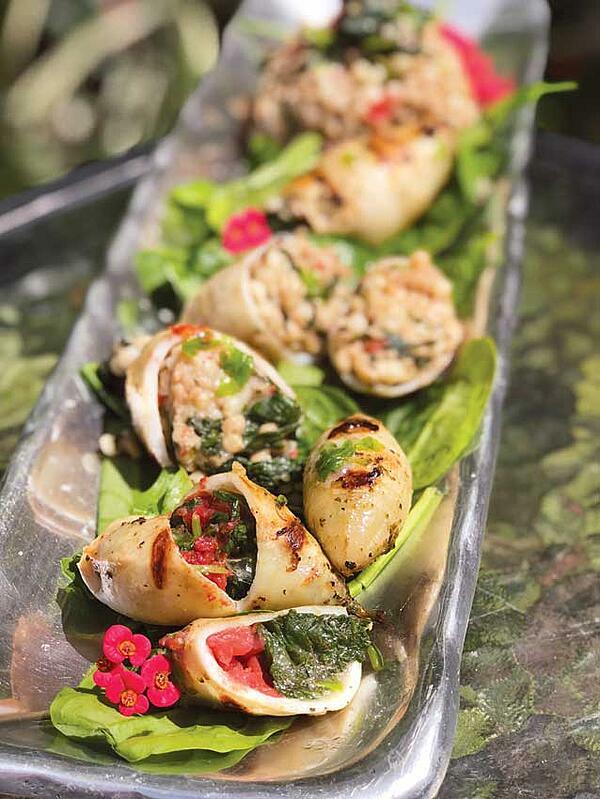 Squeeze lemon wedges over each stuffed calamari and transfer to a serving platter. Remove toothpicks and serve.